EZ Speech is designed for those who have lost their ability to speak (but are able to read) as a result of stroke, cancer, laryngectomy, cerebral palsy, parkinson’s, ALS or any other medical condition. EZ Speech is the first speech app that offers an embedded to link to hundreds of additional topic an phrases contributed by other EZ Speech users. EZ Speech provides easiest, most effective approach to conversation speech for literate individuals who require a way to “speak” by either typing or choosing from existing topics and phrases, or by adding new ones. 1. 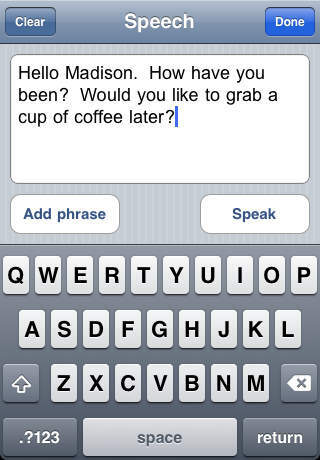 Typing-to-Speech – Type whatever you want to say and press the “Speak” button. 2. Text Saving/Retrieval – Create longer paragraphs, or complete speeches and save them for later retrieval. 4. 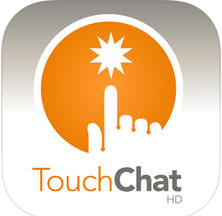 Share-a-Phrase – Possibly the most exciting feature in a speech app. The ability to press a single button and retrieve Topic/Phrases contributed by other EZ Speech users!! 5. Neospeech Premium Voices – Top quality, natural sounding voices in US English Male and Female. No more awful robotic sounding voices. Neospeech voices are 99% indistinguishable from actual human speech, because they are created from samples of actual human speech. EZ Speech comes preloaded with 13 Topics and over 350+ phrases. Or simply type something and press the “Speak” button. Or add as many topics and phrases as you like and create a customized vocabulary. 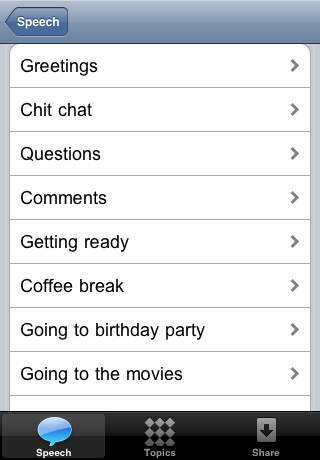 Add as many Topics (eg. Going to the movies) and associated phrases (eg. “2 tickets please”, “large popcorn”, “not too much butter please”) as you want or need. Unlimited vocabulary. EZ Speech is the first speech app that offers an embedded to link to hundreds of additional topic an phrases contributed by other EZ Speech users. All these additional topics and phrases are accessible from a single button to quickly add as many new items without any effort on your part! At no additional charge! Gus Communication Devices has been a leader in speech/communication apps for over 18 years. We offer free tech support (telephone, email and live chat). More info from Gus Communication.